Diffuse correlation spectroscopy (DCS), combined with time-resolved reflectance spectroscopy (TRS) or frequency domain spectroscopy, aims at path length (i.e. depth) resolved, non-invasive and simultaneous assessment of tissue composition and blood flow. However, while TRS provides a path length resolved data, the standard DCS does not. Recently, a time domain DCS experiment showed path length resolved measurements for improved quantification with respect to classical DCS, but was limited to phantoms and small animal studies. Here, we demonstrate time domain DCS for in vivo studies on the adult forehead and the arm. We achieve path length resolved DCS by means of an actively mode-locked Ti:Sapphire laser that allows high coherence pulses, thus enabling adequate signal-to-noise ratio in relatively fast (~1 s) temporal resolution. This work paves the way to the translation of this approach to practical in vivo use. A. Torricelli, D. Contini, A. Pifferi, M. Caffini, R. Re, L. Zucchelli, and L. Spinelli, “Time domain functional NIRS imaging for human brain mapping,” Neuroimage 85(Pt 1), 28–50 (2014). A. Pifferi, D. Contini, A. D. Mora, A. Farina, L. Spinelli, and A. Torricelli, “New frontiers in time-domain diffuse optics, a review,” J. Biomed. Opt. 21(9), 091310 (2016). F. Martelli, T. Binzoni, A. Pifferi, L. Spinelli, A. Farina, and A. Torricelli, “There’s plenty of light at the bottom: statistics of photon penetration depth in random media,” Sci. Rep. 6, 27057 (2016). D. A. Boas and A. G. Yodh, “Spatially varying dynamical properties of turbid media probed with diffusing temporal light correlation,” J. Opt. Soc. Am. A 14, 192 (1997). T. Durduran, R. Choe, W. B. Baker, and A. G. Yodh, “Diffuse optics for tissue monitoring and tomography,” Rep. Prog. Phys. 73(7), 76701 (2010). A. G. Yodh, P. D. Kaplan, and D. J. Pine, “Pulsed diffusing-wave spectroscopy: High resolution through nonlinear optical gating,” Phys. Rev. B Condens. Matter 42(7), 4744–4747 (1990). J. Sutin, B. Zimmerman, D. Tyulmankov, D. Tamborini, K. C. Wu, J. Selb, A. Gulinatti, I. Rech, A. Tosi, D. A. Boas, and M. A. Franceschini, “Time-domain diffuse correlation spectroscopy,” Optica 3(9), 1006–1013 (2016). F. Martelli, S. Del Bianco, L. Spinelli, S. Cavalieri, P. Di Ninni, T. Binzoni, A. Jelzow, R. Macdonald, and H. Wabnitz, “Optimal estimation reconstruction of the optical properties of a two-layered tissue phantom from time-resolved single-distance measurements,” J. Biomed. Opt. 20(11), 115001 (2015). J. Steinbrink, H. Wabnitz, H. Obrig, A. Villringer, and H. Rinneberg, “Determining changes in NIR absorption using a layered model of the human head,” Phys. Med. Biol. 46(3), 879–896 (2001). Q. Zhao, L. Spinelli, A. Bassi, G. Valentini, D. Contini, A. Torricelli, R. Cubeddu, G. Zaccanti, F. Martelli, and A. Pifferi, “Functional tomography using a time-gated ICCD camera,” Biomed. Opt. Express 2(3), 705–716 (2011). A. Puszka, L. Di Sieno, A. D. Mora, A. Pifferi, D. Contini, G. Boso, A. Tosi, L. Hervé, A. Planat-Chrétien, A. Koenig, and J.-M. Dinten, “Time-resolved diffuse optical tomography using fast-gated single-photon avalanche diodes,” Biomed. Opt. Express 4(8), 1351–1365 (2013). A. Pifferi, “Sviluppo e caratterizzazione di un laser a titanio in zaffiro funzionante in regime continuo e di mode-locking”, Master thesis, Politecnico di Milano, Italy, 1991. D. Waithe, M. P. Clausen, E. Sezgin, and C. Eggeling, “FoCuS-point: Software for STED fluorescence correlation and time-gated single photon counting,” Bioinformatics 32(6), 958–960 (2016). FoCuS-point github page. https://github.com/dwaithe/FCS_point_correlator , last accessed: 18/08/17. M. Wahl, I. Gregor, M. Patting, and J. Enderlein, “Fast calculation of fluorescence correlation data with asynchronous time-correlated single-photon counting,” Opt. Express 11(26), 3583–3591 (2003). P.-A. Lemieux and D. J. Durian, “Investigating non-Gaussian scattering processes by using nth -order intensity correlation functions,” J. Opt. Soc. Am. A 16, 1651 (1999). D. J. Pine, D. A. Weitz, P. M. Chaikin, and E. Herbolzheimer, “Diffusing wave spectroscopy,” Phys. Rev. Lett. 60(12), 1134–1137 (1988). D. A. Boas, S. Sakadžić, J. Selb, P. Farzam, M. A. Franceschini, and S. A. Carp, “Establishing the diffuse correlation spectroscopy signal relationship with blood flow.,”, Neurophotonics 3, 31412 (2016). R. C. Mesquita, N. Skuli, M. N. Kim, J. Liang, S. Schenkel, A. J. Majmundar, M. C. Simon, and A. G. Yodh, “Hemodynamic and metabolic diffuse optical monitoring in a mouse model of hindlimb ischemia,” Biomed. Opt. Express 1(4), 1173–1187 (2010). M. S. Patterson, B. Chance, and B. C. Wilson, “Time resolved reflectance and transmittance for the non-invasive measurement of tissue optical properties,” Appl. Opt. 28(12), 2331–2336 (1989). M. Diop and K. St Lawrence, “Boundary conditions independent diffuse correlation spectroscopy,” Proc. SPIE 9319, 931917 (2015). H. Wabnitz, D. R. Taubert, M. Mazurenka, O. Steinkellner, A. Jelzow, R. Macdonald, D. Milej, P. Sawosz, M. Kacprzak, A. Liebert, R. Cooper, J. Hebden, A. Pifferi, A. Farina, I. Bargigia, D. Contini, M. Caffini, L. Zucchelli, L. Spinelli, R. Cubeddu, and A. Torricelli, “Performance assessment of time-domain optical brain imagers, part 1: basic instrumental performance protocol,” J. Biomed. Opt. 19(8), 086010 (2014). L. Cortese, ICFO-The institute of photonic science, av Carl Friedrich Gauss, 3, 08860 Castelldefels, Spain, and G. L. Presti, M. Pagliazzi, D. Contini, A. Dalla Mora, A. Pifferi, S. Konugolu Venkata Sekar, L. Spinelli, P. Taroni, P. Zanoletti, U. Weigel, S. de Fraguier, A. Nguyen-Dinh, B. Rosinski, & T. Durduran, are preparing a manuscript to be called “Liquid Phantoms for Time-Resolved Spectroscopy and Diffuse Correlation Spectroscopy with tunable optical and dynamic properties”. W. B. Baker, A. B. Parthasarathy, T. S. Ko, D. R. Busch, K. Abramson, S.-Y. Tzeng, R. C. Mesquita, T. Durduran, J. H. Greenberg, D. K. Kung, and A. G. Yodh, “Pressure modulation algorithm to separate cerebral hemodynamic signals from extracerebral artifacts,” Neurophotonics 2(3), 035004 (2015). L. Spinelli, A. Pifferi, D. Contini, R. Cubeddu, and A. Torricelli, “Time-resolved optical stratigraphy in turbid media,” Proc. SPIE 7371, 73710A (2009). R. C. Mesquita, S. S. Schenkel, D. L. Minkoff, X. Lu, C. G. Favilla, P. M. Vora, D. R. Busch, M. Chandra, J. H. Greenberg, J. A. Detre, and A. G. Yodh, “Influence of probe pressure on the diffuse correlation spectroscopy blood flow signal: extra-cerebral contributions,” Biomed. Opt. Express 4(7), 978–994 (2013). A. Torricelli, A. Pifferi, L. Spinelli, R. Cubeddu, F. Martelli, S. Del Bianco, and G. Zaccanti, “Time-resolved reflectance at null source-detector separation: Improving contrast and resolution in diffuse optical imaging,” Phys. Rev. Lett. 95(7), 078101 (2005). G. Yu, T. Durduran, G. Lech, C. Zhou, B. Chance, E. R. Mohler, and A. G. Yodh, “Time-dependent blood flow and oxygenation in human skeletal muscles measured with noninvasive near-infrared diffuse optical spectroscopies,” J. Biomed. Opt. 10(2), 024027 (2005). A. Pifferi, A. Torricelli, R. Cubeddu, G. Quarto, R. Re, S. K. V. Sekar, L. Spinelli, A. Farina, F. Martelli, and H. Wabnitz, “Mechanically switchable solid inhomogeneous phantom for performance tests in diffuse imaging and spectroscopy,” J. Biomed. Opt. 20(12), 121304 (2015). J. Selb, J. J. Stott, M. A. Franceschini, A. G. Sorensen, and D. A. Boas, “Improved sensitivity to cerebral hemodynamics during brain activation with a time-gated optical system: analytical model and experimental validation,” J. Biomed. Opt. 10(1), 11013 (2005). 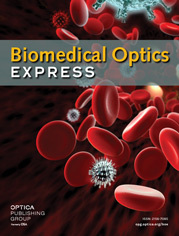 P. Sawosz, M. Kacprzak, N. Zolek, W. Weigl, S. Wojtkiewicz, R. Maniewski, and A. Liebert, “Optical system based on time-gated, intensified charge-coupled device camera for brain imaging studies,” J. Biomed. Opt. 15(6), 066025 (2010). Fig. 1 The sketch of the experimental setup for the time domain DCS system. Fig. 2 Sketch of the two-layer liquid phantom holder. 𝛿 is the thickness of the superficial layer (S). Fig. 3 (Top) DTOF curves of the two homogeneous liquid mixtures, with (30% gly) and without (0% gly) glycerol. (Bottom) Gated auto-correlation decay rates ( k⋅s) for the dynamically homogeneous (DH, triangles) and dynamically heterogeneous (DA, circles) two-layer phantom configurations. Here, 𝛿 represents the thicknessof the superficial (S) layer of the phantom (see Fig. 2). The path length s is computed from the time-of-flight as s=v⋅t, where v is the speed of light in the medium. Figure 6 in the Appendix shows the corresponding measured auto-correlation curves for different gate positions. Fig. 4 (a) Intensity auto-correlations for the early and late gates, and the ungated auto-correlation when no pressure is applied. (b) Electric field auto-correlation for the early gate when pressure is applied on the probe as compared to when no pressure applied. The distortions from the model at late lag times is a common feature of in vivo DCS data as illustrated in ref  (Fig. 8 therein). Figure 7, in the Appendix, shows the full set of curves. (c) Relative BFI (rBFI) for two different gates (early and late) and two pressure conditions (no pressure, with pressure) is shown. Fig. 5 Relative BFI (normalized to the first 100 s) during a cuff occlusion experiment. Dots represent the broad gates analysis and havea 1 s resolution. The continuous line is the rBFI estimation from ungated analysis carried out with the hardware correlator (1 second resolution). Fig. 6 (a) Electric field auto-correlation functions (g1) with respect to the lag time as calculated for narrow 160 ps gates with an increasing starting time corresponding to the gate positions shown in panel (b). (b) Colored markers represent where the gates have been selected, corresponding to the DTOF. (c) The variation of the intensity auto-correlation intercept β with respect to the sequential gate number. All curves/makers in all panels are color coded to match the position on the DTOF curve in panel (b). Fig. 7 Measured and fitted electric field auto-correlation functions for in vivo head experiments. Here we show two gated (early, late) and ungated calculations for different applied pressure conditions: no pressure (circles) and with pressure (diamonds). The solutions to the correlation diffusion equation was used to fit the ungated and the numeric integration was used to fit the gated results (solid lines). Table 1 Relative D B when S layer is filled by 30% glycerol added phantom (dynamically heterogeneous case), for changing S layer thickness δ, compared to the late gate or region, δ = 5 mm, value (100%). Relative D B when S layer is filled by 30% glycerol added phantom (dynamically heterogeneous case), for changing S layer thickness δ, compared to the late gate or region, δ = 5 mm, value (100%).